Application Deadline: 9th June 2017. Eligible Field of Study: Those who wish to study in Japan as an undergraduate student must choose a field of major from (1) or (2) below. Applicants may enter a first, second, and third choice. For postgraduate, applicants should apply for the field of study they majored in at university or its related field. Moreover, the fields of study must be subjects which applicants will be able to study and research in graduate courses at Japanese universities. About the Award: The Japanese Government’s Ministry of Education, Culture, Sports, Science and Technology (MEXT) offers scholarships for academic study in Japan to foreign students interested in deepening their understanding of the Japanese language, Japanese affairs and Japanese culture. 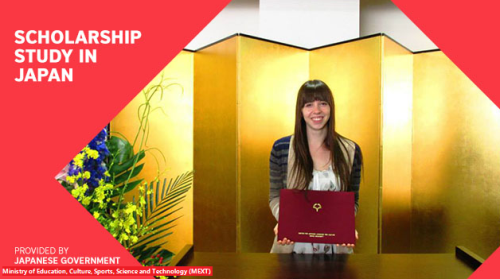 The purpose of these scholarships is to promote mutual understanding and deepening friendly ties between Japan and other countries through the application of advanced knowledge regarding Japan’s language and culture. The deadline of the applications differ according to the country. Please contact with Japanese embassy or consulate general in your country. Duration of Scholarship: For undergraduate, the scholarship period will last for five years from April 2016 to March 2021, including the one-year preparatory education in the Japanese language and other subjects due to be provided upon arrival in Japan. For scholarship grantees majoring in medicine, dentistry, veterinary medicine or a six-year course in pharmacy, the scholarship period will be seven years until March 2023. For postgraduate, between 18 & 24 months. How to Apply: Visit the general scholarship webpage for details. For country specific details, please contact with Japanese embassy or consulate general in your country. All the information about Japanese Government (MEXT) Full Scholarship Program for International Students has been delivered nicely; talented students who are eager to pursue their Free Tuition/Scholarships/Study in Japan for Undergraduate, Bachelors, Postgraduate, Masters, PhD, Associate Degree and Other Degrees, can apply now. Sponsors: The Japanese Government’s Ministry of Education, Culture, Sports, Science and Technology (MEXT).